One of the greatest feelings that I get is when my daughter asks me to crochet her something. 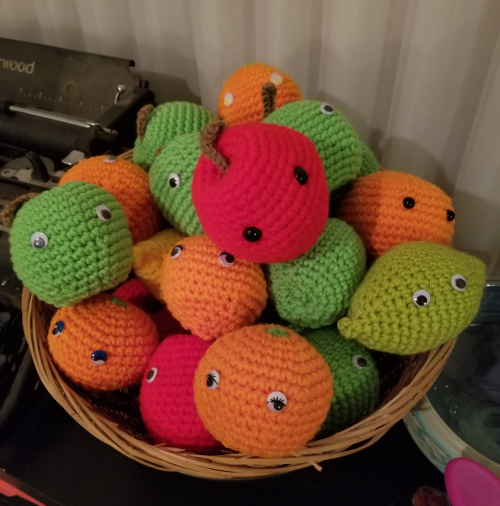 As she had gotten older, she has asked for less items, which is bittersweet because she usually asked for amigurumis. She just doesn’t play anymore. 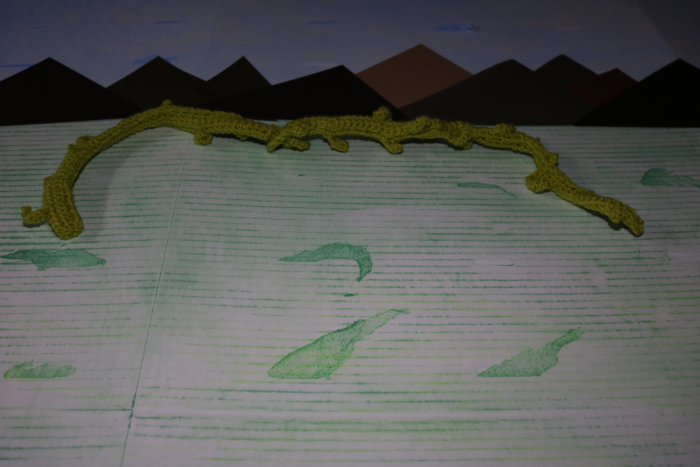 But at school in theatre class, her group is doing a PSA based on a popular story – Jack and the Beanstalk. 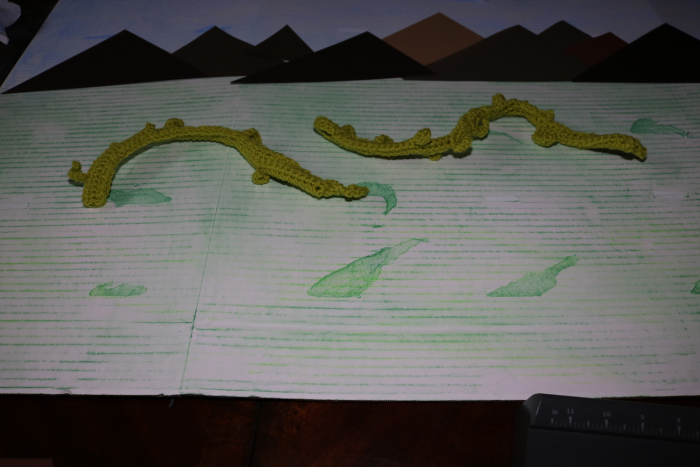 She asked me to crochet her a beanstalk that could be pulled apart since they ‘chop’ down the beanstalk. So I got the dimensions she needed and went right to work. I came up with basically 5 rows of single crochet with leaves off the stalk and then sewed up the ends making a tube. I would do the leaves as I did the row but just chaining 5 or 6 and then slip stitch into the first chain from the hook, then single crochet, half double crochet, then single crochet, and slip stitch again. 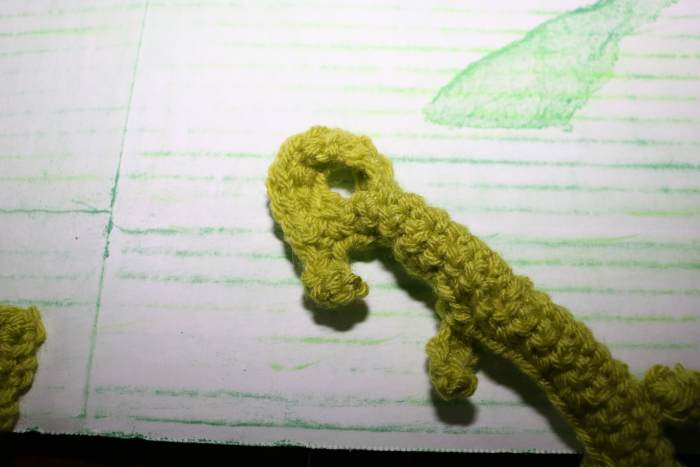 To allow for the break apart effect, I crocheted two pieces and added a loop at one end so that the stalk could attach to it. It turned out pretty cute especially for something I just did on the fly and really wasn’t sure what I would do. It’s fun to do these sort of things for her as I enjoy making her things and the challenge of it is nice, too. It is safe to say that I have more crochet projects that I doubt I will ever finish them all, but it is so much fun to browse patterns. For quite some time, I’ve been tinkering with the idea of writing crochet patterns. I have written a few but that’s about it. But I have ideas. Lots of ideas. So to keep track of my ideas and projects I started a crochet notebook. For my notebook I use a composition notebook that has grid paper since I draw out my ideas. It just helps me work out those details of the design. I was ambitious and thought I will fill a notebook yearly but here it is three years later and I am still have plenty of pages in that first notebook. I do like this type of notebook that uses discs instead of wire. So it’s really tempting on several levels. But since I already have an established crochet notebook I couldn’t reason with myself why I would really need it. 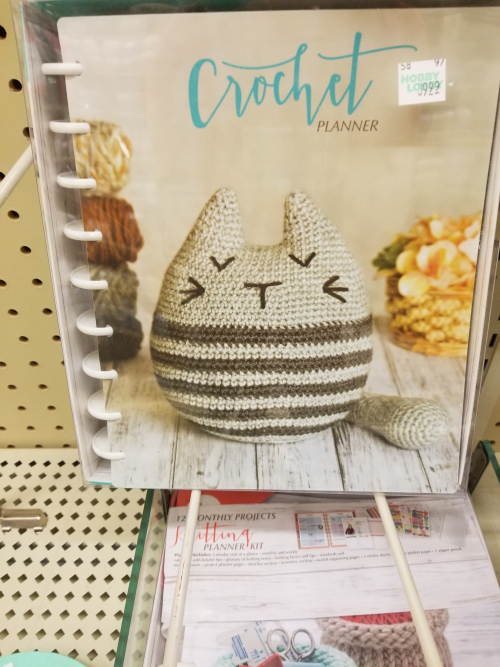 It did serve as a good reminder that I do have a notebook where I keep crochet ideas and maybe I should periodically revisit it and actually make progress. Besides a notebook I used Google Drive a lot to capture crochet ideas. But I do admit there is nothing like pen and paper to get ideas out and to make them seem valid if that makes sense. Maybe the act of writing it on paper and it’s semi-permanent(if you use a pencil you can always erase) that gives it more substance that just something digital that I could easily delete. It’s wonderful to crochet for family. 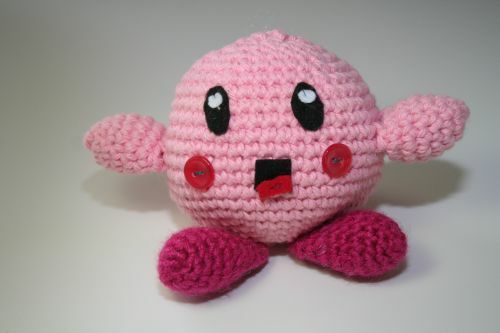 My daughter has challenged me several times to crochet her stuff. I love doing this as it not only keeps me on my toes but it is nice to make her something she absolutely loves. There’s no better reason to pick up the hook than putting a smile on someone’s face. When Kirby’s Epic Yarn was released, needless to say that I was excited. Being a gamer and a crocheter it was a no-brainer that I must play this game. My daughter and I would play it together for hours. Good times indeed. Kirby was a little more challenging. His body was easy as was his feet. It was his face that presented a problem. It’s very expressive. Safety eyes wouldn’t work and I am not that strong with embroidery. I tried felt. I see so many wonderful examples of crocheters using felt with their projects and it all is very stunning. I do not enjoy working with felt. Cutting a circle is the hardest thing ever. One way I got better with felt was buying a nice pair of scissors. Since I had gained some confidence with felt thanks to the scissors, I decided to make the eyes and mouth out of felt. This was my second Kirby. 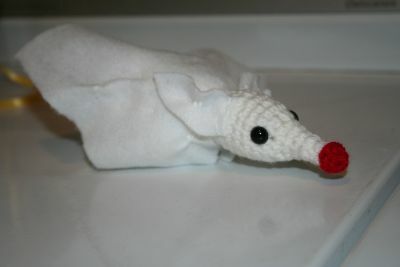 The first one I tried to embroider the eyes, and it was a complete failure. This one turned out so much better. While I am a long way from being really good with felt, it is nice to know that I can work with it enough to do small projects. If your family is like ours, then you have plenty of plastic eggs lying around the house. After Easter, these plastic eggs take up space and while you can reuse the plastic eggs in useful ways, you can also craft with them. 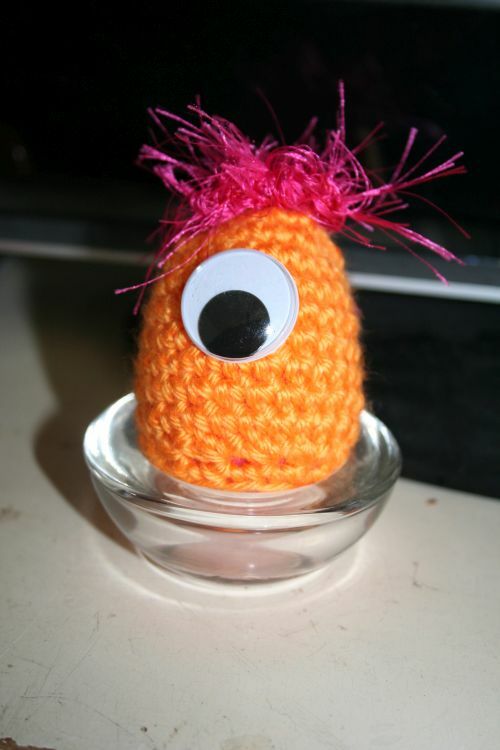 This is my monster egg cozy. Isn’t he adorable? He is very easy to make. Just choose some yarn, crochet hook around 3.0 mm, and then chain two. Work even single crochets until you cover the egg. Then do a couple of rounds of decreases leaving the bottom large enough so you can place the egg through it comfortably. I glued a large, googly eye on it and used some fun fur yarn to make some hair. It was a fast, simple project that turned out really cute. It’s a great project for leftover yarn. So dress up those plastic Easter eggs and make them a toy your kids will want to play with anytime of the year. I got a wild idea about the middle of November to make everyone crochet beanies for Christmas. I had just had surgery in October and was home recovering thinking I had plenty of time. I compiled my list of hats I needed to make. There were over 50 names on that list and with a schedule of making two a day and sometimes three I could technically make a Christmas deadline. Two hats a day was an impossible task for me with a full-time job and also just how slow I am apparently at making hats. Really thought I could whip those up faster. So here I sit the first week of February and still not done with these hats. At this point these hats are giant leap towards crochet hats for Christmas 2017 as winter will soon be over if not already in our part of the country. 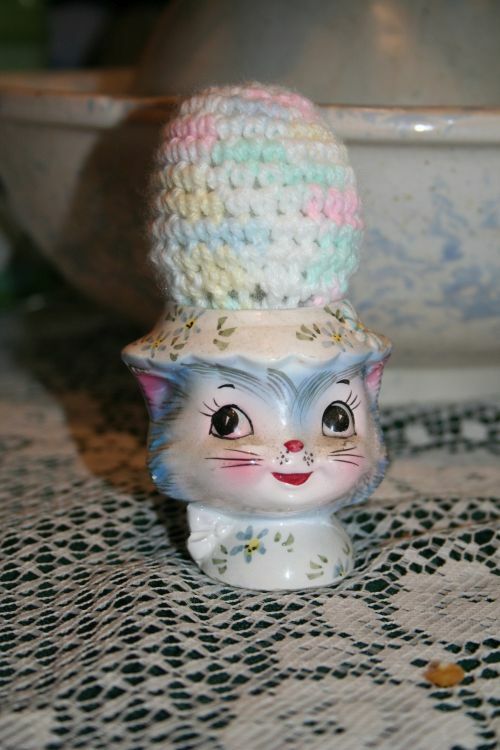 My grandmother always crocheted Christmas gifts throughout the year. Every November when I decide to make gifts then spend every free moment crocheting, I see her wisdom in her planning and vow to try it. This year I will be doing this and thanks to starting in November (and not making a Christmas deadline) I have a good amount done for Christmas 2017.